12 Cave Creek Ct. Bloomington, IL - FOR SALE by Couillard & Co.
Move-in Ready 2-Story Home in White Eagle South on a Quiet Cul-de-sac surrounded by beautiful landscaping. Welcome home! 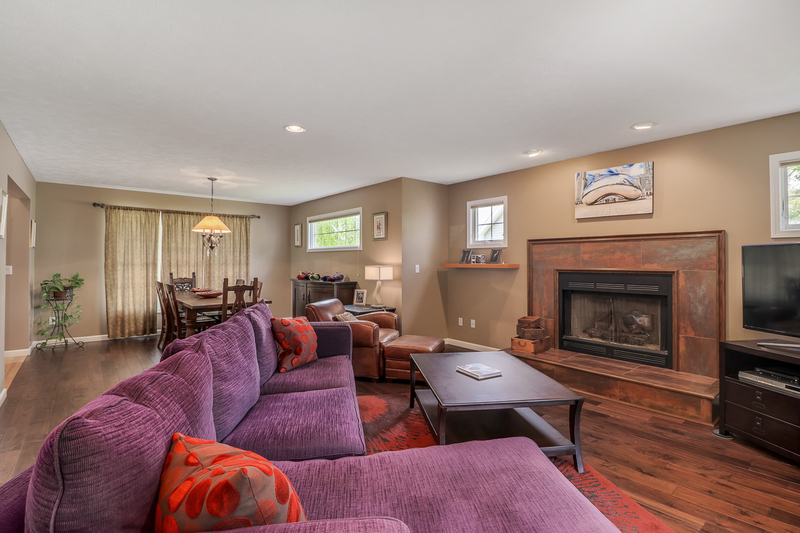 This home shows great pride in ownership – clean, neat, & organized. The first floor offers a formal foyer that looks out to the large dining room and living room with gas fireplace and dark hardwood floors that you’ll love! The eat-in kitchen offers a large island, plenty of cabinets and counter space, a half bath, and laundry room. Upstairs boasts all three bedrooms. The Master Suite is to die for! Large room, vaulted ceilings, huge bath with gorgeous newly titled shower and large dual vanity. Hall full bath is enormous – sure to suit any family or guests. Partially finished basement provides another large living space along with convenient built-ins. Unfinished area great for storage and also has a rough-in for another bathroom and egress window for possible 4th bedroom. Out back you’ll find a brand new Trex deck – hardly needs maintenance – and big fenced yard!